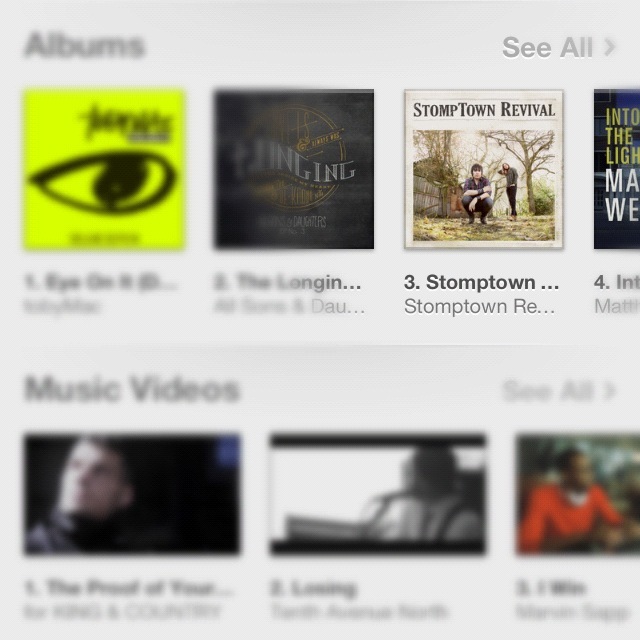 StompTown Revival Reaches #3 on iTunes Album Chart! Last week proved to be an incredible week for StompTown Revival as the new duo transcended expectations reaching #3 on the iTunes Christian Album Chart. The Save The City Records release held strong throughout the remainder of the week occupying the Top 5 for a few days and Top 10 throughout the weekend. The achievement was a feat that very few accomplish with no radio play,. StompTown Revival’s marketing strategy was built around touching a musical need that rests deep in the soul of Americans. “Roots, traditions, blues and hymns are what built American music” states StompTown’s Gabe Martinez. The talent of the duo led to StompTown Revival becoming one of the featured performers at the Christian Music Summit that was held for the first time in Nashville, TN October 5-6. The invitation to perform came from one of the co-founders of the 9-year conference, Bruce Adolph, who is also President of the Adolph Agency, Inc in Seattle, WA and publisher of Christian Musician and Worship Musician.